Decorative Window Films are a great addition to any home and can be installed on any glass or mirror surface. At a fraction of the cost of etched or frosted glass uses include: decorative privacy glazing, front entrance side lights, glass entry doors, bathroom shower doors or mirrors, kitchen and laundry room windows, glass tabletops or glass cabinets and more. Decorative glass designs can also be easily removed and updated to new designs as needed. Decorative Window Films can be used for a variety of uses in commercial buildings and offices. Great choice of styles that resemble frosted glass or etched glass in many colors and designs at a fraction of the cost. Decorative tinting can also be easily removed or updated as needed. 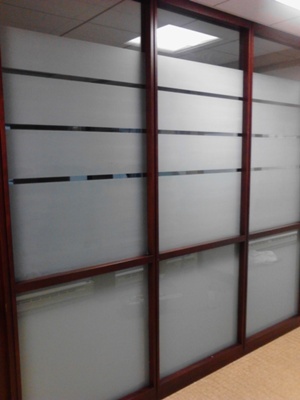 Uses include: creating glass dividers, privacy glass for interior or exterior windows or glass doors, conference room wall screens, side light glazing, inter office partitions, glass cabinet windows and more. Solas Window Tint provides professional installation of decorative window films and privacy glass coating to residential homes, businesses, retail storefronts, government buildings and more throughout Maryland and Washington DC including Anne Arundel County, Queen Anne's County, Prince Georges County, Howard County, Baltimore Maryland and other counties. Call or email for details.